I finally got some time to myself this weekend and had myself a Friday Night Frights session. What did I watch? Read on and find out. Some of the most effective horror movies work so well because they take a simple idea and run with it. Maybe it's a shark terrorizing a town. Maybe it's a bogeyman who stalks you while you are babysitting. 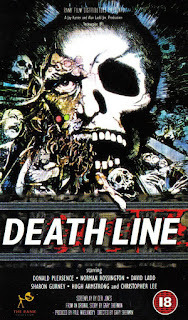 Or maybe, in the case of Death Line, it's a cannibal living in the subway tunnels. In a London Underground station, a man propositions a prostitute while waiting for the trains. She declines and walks off, leaving him there alone when someone unseen approaches him. Two university students are on their way home one night when they encounter the man collapsed on the stairs leading to the subway. When they come back with help for him, the body is gone. The theory is that he woke up and wandered off, but the actual reason is that the cannibal retrieved his prey to give a snack to his dying companion. An investigation is opened by a team led by Donald Pleasance (who is an absolute hoot and miles away from his Dr. Loomis performance). They initially suspect the students of foul play, but they find that the rumors of a group of survivors who survived a cave-in years ago is quite true as the cannibal goes on a rampage, saddened by the death of his loved one. The students find themselves caught in the middle and must try to survive without becoming the next item on his menu. The subways have always been creepy to me. Dark tunnels filled with steam and rats that stretch on for miles. You wait for the train, alone, while others mill about. And when there isn't anybody around? Well, the quiet makes your mind jump to all sorts of things that might be lurking about. In a way, the darkness down there is sort of like the ocean, where it hides the danger inside it. Death Line manages to play on these fears and turns a place where you should be relatively safe into a nightmare labyrinth. Gary Sherman (Vice Squad, Dead and Buried) crafts this tale exquisitely, from the jazzy music at the beginning to lull you into a false sense of security, to the slow pans over the domain of the cannibal that remind me of the attic shots from Black Christmas. The tension builds until the final confrontation, and even the comedic turn by Pleasance only serves as a temporary relief valve. The only scene that truly feels out of place is one where he meets Christopher Lee as a MI5 agent in the missing man's apartment. While the banter between them is nice, it does feel like they just wanted to get the two together, resulting in a fun bit that doesn't really offer much to the movie. All in all it's an excellent little thriller and worth checking out. 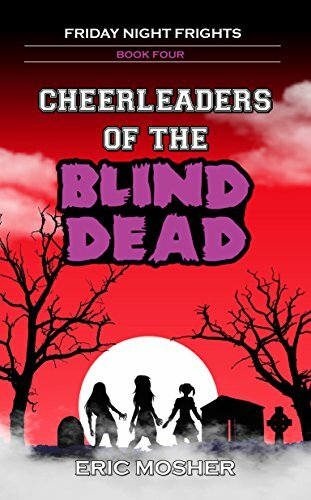 Cheerleaders of the Blind Dead is Now Available! The anticipated fourth entry in the terrifying Fright Night Frights series is here! Now you too can read the continuing adventures of Dave and Mike, the erstwhile vampire hunters, as they travel to the town of Sikoraville to answer a call for help and find that everything is not what it seems. This town's dark secret likes to come out at night and feed on the blood of the living and it is up to the boys and two new friends to stop it once and for all in Cheerleaders of the Blind Dead.